I ran into an old friend a few weeks ago and as we were catching up and I was telling him what Imagine was doing these days, he asked me what motivated me to start an outsourced sales development program. While this wasn’t the first time that I had been asked that question, for some reason it really resonated with me. It was probably because of all of the learning we’ve had in the two + years we’ve been offering the service. We started our approach before we really even knew about the growth and proliferation of sales development as a discipline. It started with an attempt to mimic the inside sales teams I and our President, David Fletcher had run previously in our careers. What we learned was that, for the companies we were working with at least, appointment setting was not sufficient. We had worked with a few different appointment setting organizations with clients and none of them drove the business results that were needed. Additionally, we found that our experience was quite common among executives we knew who utilized the services as well. I certainly don’t want to say that appointment setting approaches or services don’t work for anyone. What’s important is understanding the difference between the approaches so that you can determine which approach (and potentially which service) would serve your needs the best. 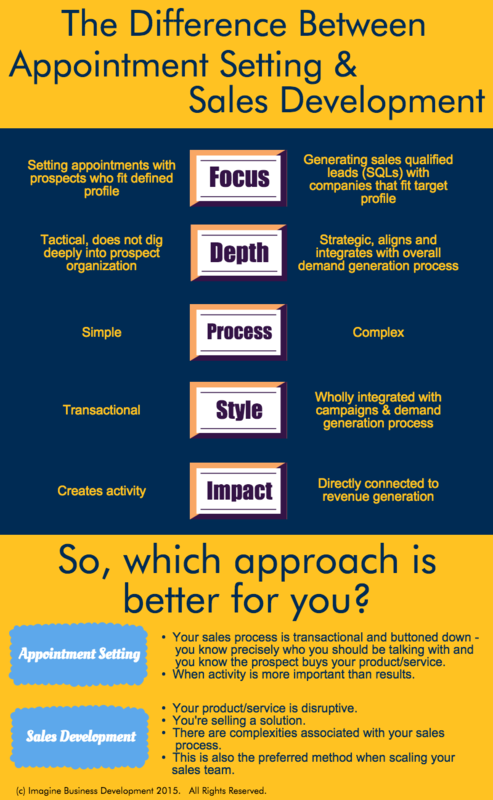 Sales development integrates lead nurturing, telephone prospecting and data to align lead generation and sales holistically, accelerating the demand generation process; while appointment setting is a more transactional approach that often doesn’t align with a comprehensive demand generation approach. The focus of appointment setting is, well, exactly what it says; getting an appointment with someone who fits a basic set of criteria and is open to talking. While the assumption is that someone who is open to talking is open to a sales conversation, that is not always the case. In sales development, the focus is all about creating sales qualified leads (SQLs). So while appointments are certainly set through sales development efforts, that’s the byproduct, not the focus. A major difference between the two approaches is the depth in which they go. Sales development goes much deeper and is fully integrated into the new sales process. Since the focus is on the creation of SQLs, the sales development function must dig deeper than appointment setting approaches. With sales development you’re moving through the vast majority of the discovery phase and into the needs assessment/diagnosis phase. With appointment setting, since the focus is on the appointment, the process doesn’t dig as deep. The reality is that often the incentive is unintentionally in conflict with your end goal. The “sale,” for lack of a better word, is on setting the appointment, and therefore receptivity is overvalued and appointments are often set with people that are not ready or qualified. For example, in an appointment setting engagement (whether you’re using an outsourced provider or implementing the process internally) you may have specified that you want to meet the director of IT because that is typically the person that you sell to. When the focus is on the appointment, you attack the situation like a dog with a bone. You work to set an appointment with the IT director. Now 35% of the time it turns out that someone other than the IT director actually manages the issues that actually cause sales for you to happen. The appointment setting process doesn’t handle this issue well. With sales development’s deeper approach, we learn that for one company it’s the controller that deals with the issue, while in another we learn it’s the director of operations. The sales development rep also also digs deeper in the profiling to ensure that a sales rep is meeting with the right person (people) at the right time with the right context. 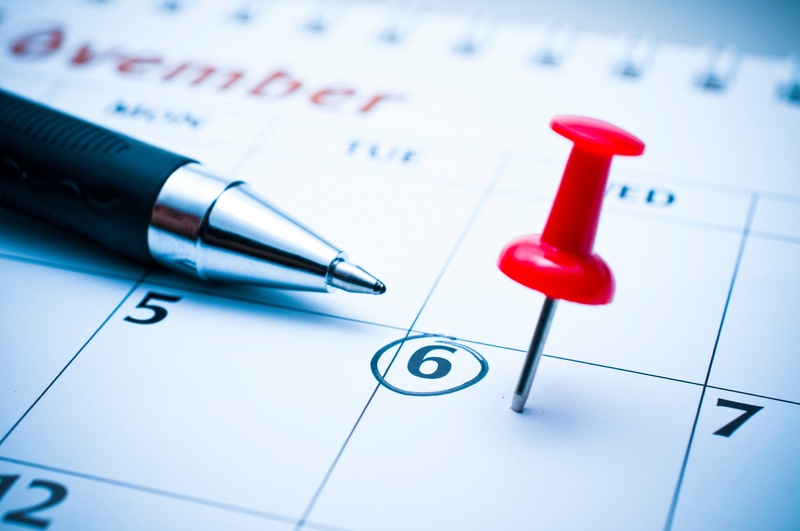 Appointment setting is a simple process. Frankly, this is the reason that there are so many firms that offer outsourced appointment setting services. With this approach, you simply work a list of contacts and set appointments with as many of them as you can. Once the appointment is set, you turn it over to the salesperson and the appointment setting process is complete. It’s very simple, and there are clean lines of separation and responsibilities. Successful sales development is an extraordinarily complex process. Because it’s integrated with the overall lead generation effort, that are a multitude of ways that a lead enters the process. Additionally, the sales development process works in concert with the new sales process in many instances. Where appointment setting has a very simple hand-off, sales development is far more like a relay race where the SDR and the salesperson work together for a period as the SQL is passed on. An example of this occurs regularly with our clients. Our SDR may be working to connect to the COO of an organization as it’s become clear it’s the COO that has the authority to change something. However, to get to the COO we must first demonstrate impact with someone lower in the organization. Because we don’t have an audience with authority, this does not meet our SQL definition. However, in order to get to authority, we need to utilize the knowledge and expertise of the new-sales salesperson. So in this case, the SDR brings in the salesperson for a meeting and then takes the process back until the COO is engaged in the process. Sales development integrates campaigns, web, nurturing and calls to create sales qualified leads. Appointment setting is more transactional. The style difference can be nuanced, but utilizing the right style for your needs is critical. The biggest difference between the two is in the impact. Sales development, while typically requiring a bigger commitment and investment, yields far greater ROI in most instances. The ability to manage more complex scenarios and the fact that it goes deeper into the sales process enables you to leverage your sales resources far more effectively. Sales development also produces more predictable results. Appointment setting often creates more activity – after all it’s much easier to get a meeting than to create a sales qualified lead. The problem can be that activity and results are not always connected. Earlier this year we began working with a company that had been using a very good appointment setting service for more than two years. The problem was that when they sat down and actually assessed results, they found out that the firm had set up more than 150 appointments, but only two of those actually became customers. They found that they often ended up meeting with the wrong people or the timing was wrong. I realize that this post illustrates a positive picture around sales development and no so much around appointment setting. However, I do not mean in any way to say that the appointment setting approach is wrong all of the time. There are two scenarios where, in my experience, appointment setting is the better choice. The first is for companies that have a very clear path to sale. If you know precisely who a meeting should be held with, the profile of the company and you know that the companies being pursued by the products/services you sell, then appointment setting can work very well. The second scenario is where you need activity more than results. Early in the life of Imagine, I utilized an appointment setting service for precisely this reason. I needed more real life conversations with prospects that fit a profile so that I could truly test our messaging and approach. While the appointment setting didn’t lead to new clients, it greatly accelerated our learning and that was quite valuable. However, if you’re selling a solution, there’s any complexity in your sales process or you need to create demand in any way, you’ll typically find that sales development is the the superior choice.